My research aims to understand how animals actively acquire and process sensory inputs both at the behavioral and neural circuit level. Research on sensory systems using immobilized animals passively receiving and processing stimuli has provided us with many valuable insights into how the brain process sensory information. However, in natural environment, animals actively collect sensory information by physically moving their sensory organs. They also actively change the way they process information by using neuromodulators to alter the properties of neural circuits. These active sensing and processing are essential for animal’s survival because they allow an animal to obtain necessary sensory information and produce context appropriate behaviors. The ultimate goal of my research is to obtain a better understanding of how a brain functions in a natural context by investigating the neural mechanisms and behavioral roles of active sensing and processing of sensory information. Studying the neural basis of active sensing and processing can be technically challenging since it requires performing physiological experiments on animals that are actively acquiring and processing inputs. I combine powerful genetic tools available in fruit flies with novel experimental setups to investigate active sensing and processing in flying fruit flies. My research focuses on the following two questions regarding active sensing and processing of sensory information. How do flies control active antennal motion during flight and what are the functional roles of this active sensor movement? How does the neuromodulator octopamine change the visual information processing during flight and how do visual inputs change the activity of octopamine neurons? Although the first question investigates the antennal mechanosensory system and the second question studies the visual system, I have found that these two systems are tightly linked together during flight. Active antennal motion is induced by visual inputs and flies move their antennae only during flight when the gain of the visual system is increased by octopamine. Preliminary data suggests that octopamine neurons may receive inputs from the antennal mechanosensory system. Studying these two questions together will lead to a better understanding of how a brain actively integrates information from multiple sensory modalities. (1) The function and control of active antennal motion in flying fruit flies. Figure 1. A schematic model of the antennal movements and their roles during flight. Visual system detects visual motion and activates both antennal and wing motor system to move the antennae and the wings. Red dotted lines show the positions of the antennae and the wings after the response to rightward visual motion. ‘S’, ‘P’, and ‘F’ stand for the scape, the pedicel, and the funiculus of the antenna. The response brings the wing and the antenna closer on the left side, and increases the movement of the PF joint through wing induced airflow. Mechanosensory neurons detect this increase and activate wing motor system to further reduce the wing stroke amplitude on the right side (green line) and enhance the visually-induced turn. Although the role of the visual system in insect flight control has been studied extensively, the role of other sensory modalities is not well understood. In a recently published study, I characterized how a fly’s antennae move during tethered flight and investigated the possible behavioral roles of these movements (Fig. 1). The most surprising finding was that flies actively rotate their antennae during visually-induced turns. Furthermore, this antennal motion was absent in non-flying flies and was strongly correlated with changes in the wing motion during turns, suggesting its role in turning responses during flight. The study also showed that the flies may be detecting the airflow generated by its flapping wings through the antennal mechanosensory system. Functionally, I found that the increase in the airflow generated by the flapping wings on one side of the body activates a reflex that reduces the stroke amplitude of the wing on the opposite side (Fig. 1). Active movement of the antenna during visually-induced turns brings the antenna on the outside of the turn closer to the wing-induced airflow, effectively increasing the gain of antennal mechanosensation on that side. Therefore, one possible role of the active movement of the antenna may be to trigger a reflex that reduces the stroke amplitude of the wing on the opposite side. This reflex would enhance visually-induced turns by amplifying the bilateral disparity in wing motion (Fig. 1). 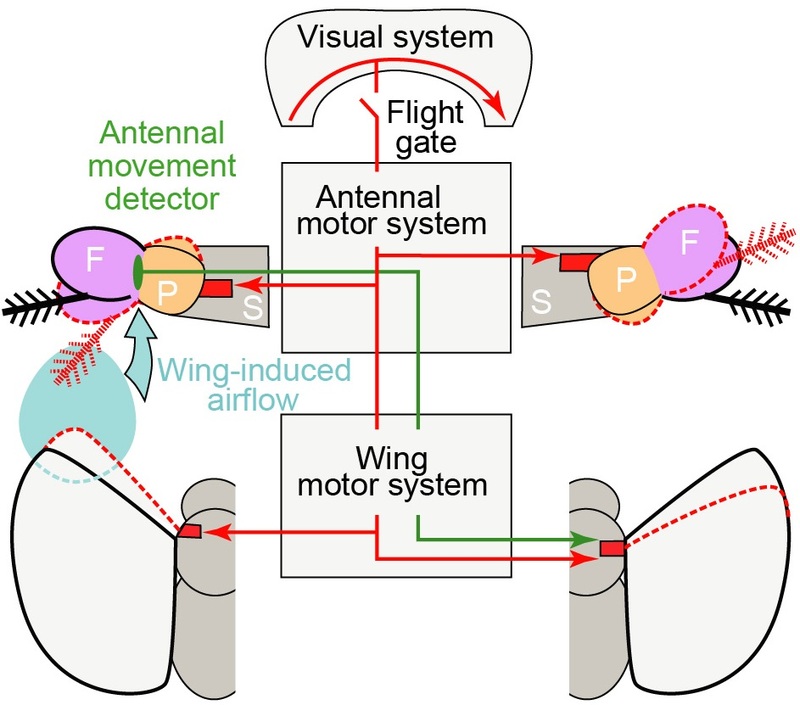 Results from behavioral studies suggest that flying fruit flies detect the airflow generated by their flapping wings through antennal mechanosensation and use this feedback to control their wing motion. To identify the neurons that detect different types of antennal motion during flight, I recently developed a 2-photon imaging preparation for simultaneously monitoring both the activity of antennal neurons and the movements of the antennae in a tethered flying fly responding to visual motion (Fig. 2A). In this preparation, I use Gal4/UAS ectopic expression system to express a genetically encoded calcium indicator in specific types of mechanosensory neurons. Using this minimally invasive technique, I can image the neurons deep in the brain to monitor their calcium activity during flight (Fig.2B), and correlate the activity of each type of mechanosensory neurons with different types of antennal motion (Fig. 2D). I found that the activity of a particular type of Johnston’s Organ (JO) neurons (JO-CE type) is highly correlated with the magnitude of the antennal oscillations caused by the flapping wings (Fig. 2D). This suggests that JO-CE neurons may be responsible for detecting the wing induced airflow and initiating the reflex that inhibit the stroke amplitude of the contralateral wing. I am currently testing this hypothesis by genetically inhibiting/ablating JO-CE neurons and studying how it affects wing stroke amplitude. Figure 2. A. A schematic of a 2-photon imaging setup for simultaneously recording the JO neuron activity and antenna/wing motion from tethered flying flies responding to visual stimuli. B. An image captured by an IR sensitive camera to track the antenna angle during the experiment. Scale bar 200 µm. C. Left: A picture of a fly head tethered to a flight stage. A section of a cuticle was removed to expose the brain for imaging. A green box indicates the location of axon terminals of JO neurons shown on the right. Scale bar 200 µm. Right: An image of axon terminals of JO neurons expressing GCaMP3 taken by a 2-photon microscope. Scale bar 20 µm. D. Calcium activity of different JO neuron terminals surrounded by dotted lines in panel B (top), the antenna angle (middle), and the power of antennal oscillations (bottom) before and during flight. Some JO neurons show activities that are correlated with the power of antennal oscillations during flight. (2) Interactions between the visual system and octopamine neurons in flying fruit flies. Previous studies have suggested that a neuromodulator octopamine orchestrates various physiological changes during insect flight. However, detailed mechanisms of how it affects sensory processing are still unknown. In a recently published study, I worked together with a graduate student in the lab, Marie Suver, to investigate how a neuromodulator octopamine increases the gain of the visual system during flight. As a part of the study, I used in vivo 2-photon calcium imaging setup described above to record the activities of octopamine neurons both at their dendrites and axon terminals. 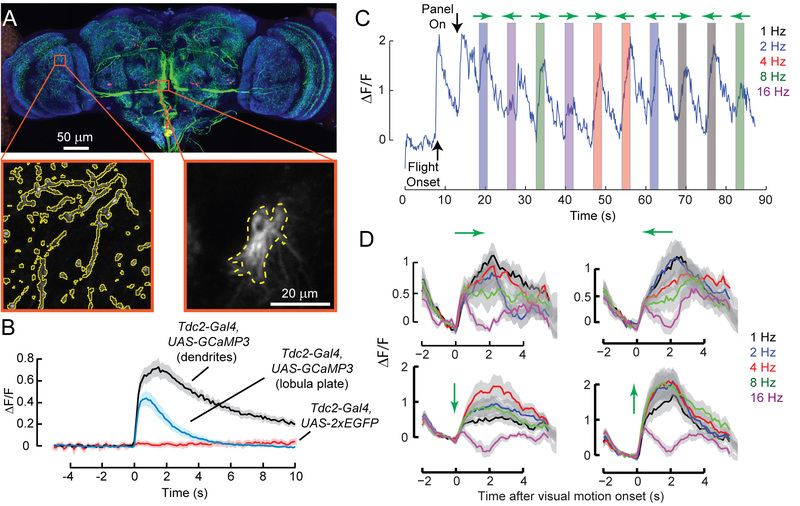 I found that octopamine neurons projecting to the optic lobes increase their activity at the onset of flight, but this activity decays rapidly especially at the axon terminals (Fig 3A and 3B). Although the activity of octopamine neuron decays rapidly during flight, increase in the gain of the visual system caused by octopamine is maintained throughout the flight. One possible explanation for this discrepancy is that the effect of octopamine is maintained for a longer period through biochemical second messenger pathways in the neurons. Another possibility is that octopamine neurons may respond to visual motion and this visual motion induced activity maintains the gain of the visual system at a high level. Consistent with the latter hypothesis, I found that octopamine neurons respond robustly and sharply to different types of visual motions (Fig 3C and 3D). This finding suggests that octopamine has the ability to control visual processing at a much finer time scale than previously thought. I am currently investigating whether octopamine also has the ability to control visual processing at a fine spatial scale by presenting visual motions in different parts of the visual field and recording from different parts of octopamine neurons. Results from these studies will advance our understanding of the temporal and spatial structure of neuromodulation in behaving animals. Figure 3. A. A confocal stack image of octopamine neuron expressing GFP (green). Red: cell nuclei, Blue: Neuropil. Orange boxes indicate regions of dendrites (right) and axons (left) where calcium recordings were made from. B. Average calcium activity in the dendrites (black) and axons (blue) of octopamine neurons during flight onset (n=7 flies). Red: changes in the intensity of fluorescence in control neurons expressing EGFP. C. Example activity in the axons of octopamine neurons during presentations of horizontal wide-field motions (shown by shaded boxes; different colors indicate different temporal frequency of the motion stimulus; green arrows indicate the direction of the motion). D. Average calcium activity in the axons of octopamine neurons in response to horizontal and vertical wide-field motions (n=9 flies). Green arrows indicate the direction of motion. Different colors indicate the temporal frequency of the stimulus. Investigating active antennal motion and its effect on antennal mechanosensory system and studying octopamine mediated changes in the visual system in flying fruit flies serve as two excellent starting points for understanding how an animal actively sense and process sensory information. In addition to the mechanosensory neurons, fly’s antennae also contain sensors for odors, humidity, and temperature. Octopamine neurons are known to be involved in many different behaviors and different octopamine neurons are believed to receive different sensory inputs. Because in vivo imaging system can be easily extended to include different types of stimuli, in the long run, I plan to expand the studies described above to investigate the functional roles and neural mechanisms of active antennal motion and octopamine mediated neuromodulation in different behavioral context and for different sensory modalities. Such an extension should provide us with general principles on active sensing and processing of sensory information. Marie P. Suver, Akira Mamiya, and Michael H. Dickinson. (2012) Octopamine neurons mediate flight-induced modulation of visual processing in Drosophila. Current Biology. 22:2294-2302. Akira Mamiya, Andrew D. Straw, Egill Tómasson, and Michael H. Dickinson. (2011) Active and passive antennal movements during visually-guided steering in flying Drosophila. The Journal of Neuroscience. 31(18):6900-6914. Akira Mamiya, Jennifer Beshel, Chunsu Xu, and Yi Zhong. (2008) Neural representations of airflow in Drosophila mushroom body. PLoS ONE. 3(12):e4063. Yalin Wang*, Akira Mamiya*, Ann-shyn Chiang and Yi Zhong. (2008) Imaging of an early memory trace in the Drosophila mushroom body. The Journal of Neuroscience. 28(17):4368-76. (* contributed equally). Akira Mamiya and Farzan Nadim. (2005) Target-specific short-term dynamics are important for the function of synapses in an oscillatory neural network. The Journal of Neurophysiology. 94(4):2590-602. Akira Mamiya and Farzan Nadim. (2004) Dynamic interaction of oscillatory neurons coupled with reciprocally inhibitory synapses acts to stabilize the rhythm period.The Journal of Neuroscience.24(22):5140-50. Akira Mamiya, Yair Manor, Farzan Nadim. (2003) Short-term dynamics of a mixed chemical and electrical synapse in a rhythmic network. The Journal of Neuroscience. 23(29):9557-64. Jozsef Csicsvari, Hajime Hirase, Akira Mamiya, Gyorgy Buzsaki. (2000) Ensemble patterns of hippocampal CA3-CA1 neurons during sharp wave-associated population events. Neuron. 28(2):585-94. Darrel A. Henze, Zsolt Borhegyi, Jozsef Csicsvari, Akira Mamiya, Kenneth D. Harris, and Gyorgy Buzsaki. (2000) Intracellular features predicted by extracellular recordings in the hippocampus in vivo. The Journal of Neurophysiology. 84(1): 390-400. Jozsef Csicsvari, Hajime Hirase, Andras Czurko, Akira Mamiya, Gyorgy Buzsaki. (1999) Fast network oscillations in the hippocampal CA1 region of the behaving rat. The Jounral of Neuroscience. 19 RC20. Jozsef Csicsvari, Hajime Hirase, Andras Czurko, Akira Mamiya, and Gyorgy Buzsaki. (1999) Oscillatory coupling of hippocampal pyramidal cells and interneurons in the behaving rat. The Journal of Neuroscience. 19(1):274-287. Akira Mamiya, Yukio Ishikawa, Akio Masui, and Yoshiaki Kono. (1998) Possible difference in the structure of acetylcholinesterase between insecticide susceptible and resistant strains of Culex tritaeniorhynchus resulted from structure-activity relationship of 3-alkylsulfonylphenyl methanesulfonates. Applied Entomology and Zoology. 33(2):315-20. Akira Mamiya, Yukio Ishikawa, Yoshiaki Kono. (1997) Acetylcholinesterase in insecticide resistant Culex tritaeniorhynchus: Characteristics accompanying insensitivity to inhibitors. Applied Entomology and Zoology. 32(1):37-44.